The Fiesta de la Vendimia (Grape Harvest Celebration) in Mendoza is a tribute to the vineyard and the Argentine wine. The Mendoza grape harvest is the biggest vineyard and wine celebration in Latin America. 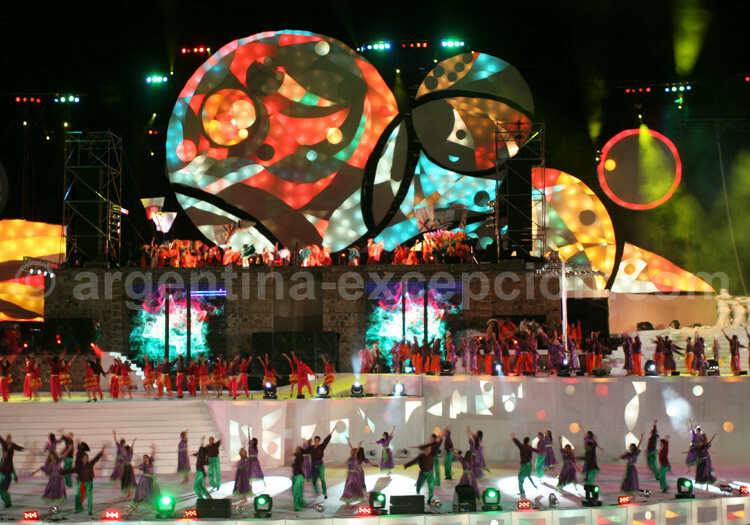 Thousands of visitors come every year to different celebrations organized in Cuyo province, especially in Mendoza, one of the eight wine capitals of the world. This celebration is a landmark in the life of the vine-growing region, since this is the place where the end of the grape harvest is celebrated, between February and March (South hemisphere). As of the first part of the seventeenth Century and the first vine cultivation in the region, the end of the grape harvest is celebrated with dances, songs, and wine tastings. The “Fiesta de las chinas” appeared at the beginning of the 19th Century, and used to end with the selection of the most beautiful “china” (peasant woman). It was not until 1936 that the Fiesta de la Vendimia was institutionalized and took today’s form. In Mendoza, the grape harvest begins the last Friday of February with the “Blessing of fruits”. During the ceremony, the Mendoza archbishop thanks God for the harvest, and there is a peregrination through several towns led by Carrodilla Virgen, Patron Virgen of vineyards. The second important moment of this event takes place on the first weekend of March, from Friday night, with the “Vía Blanca de las Reinas“. 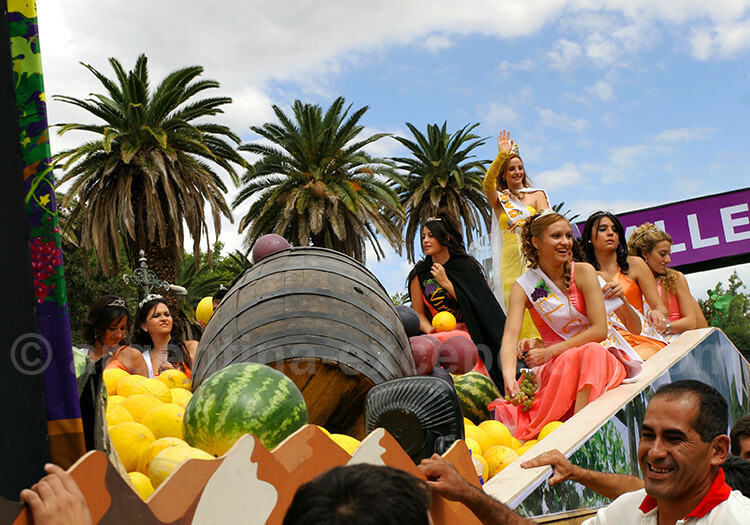 Every represented vine-growing region takes part in the Mendoza parade, with a float and a Beauty Queen. 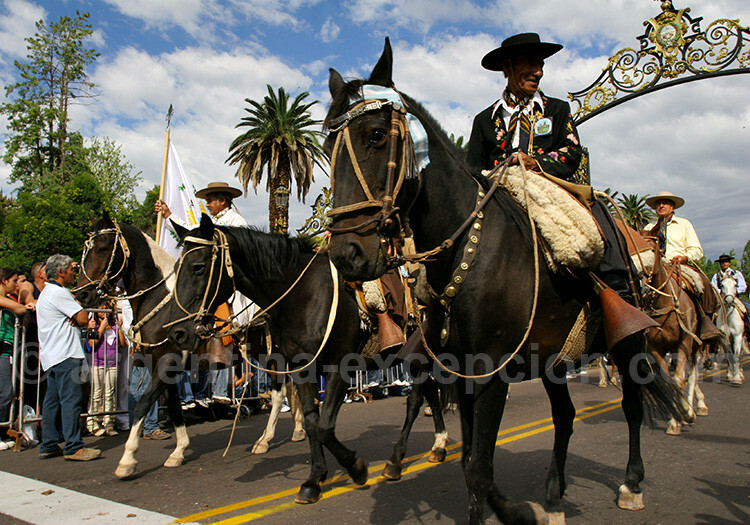 On the next day, during the “Carrusel de las Reinas“, floats parade once again before 200,000 people, along with different Argentine wine personalities, and gauchos on horseback or old transportation. All this takes place in a vivid musical environment. Visitors will go wild this weekend on Saturday, Sunday and Monday night with the “Acto central” (Central Event), a great light and sound show that gathers more than 20,000 people in the Frank Romero Day Auditorium, and some more people in the surrounding hills. In a stage of more than 4,000 m², 1,000 artists represent the passion of vineyards and earth, but also those difficulties encountered by peasants, every year, in the extraction of grapes. Every year, an original creation is proposed during these three performances, and the organizers select the winner in an open contest. The most important moment of this contest occurs at the end of the first performance, with the selection of the Vendimia Queen. – Several wineries organize wine tastings in their vineyards during this event. – Argentina Excepción offers a 3 days circuit to discover the Mendoza vineyard and live la Fiesta de la Vendimia.